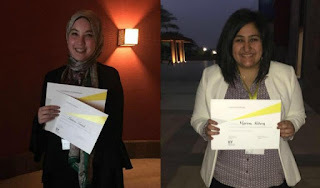 April 15, 2018, Cairo – Salma Fouad Abutaleb and Marina Philip, two students at The American University in Cairo (AUC), won first and second place, respectively, at the EY [Ernst & Young] Tax Competition held at the University. Abutaleb and Philip competed against 32 top accounting students from across Egypt. 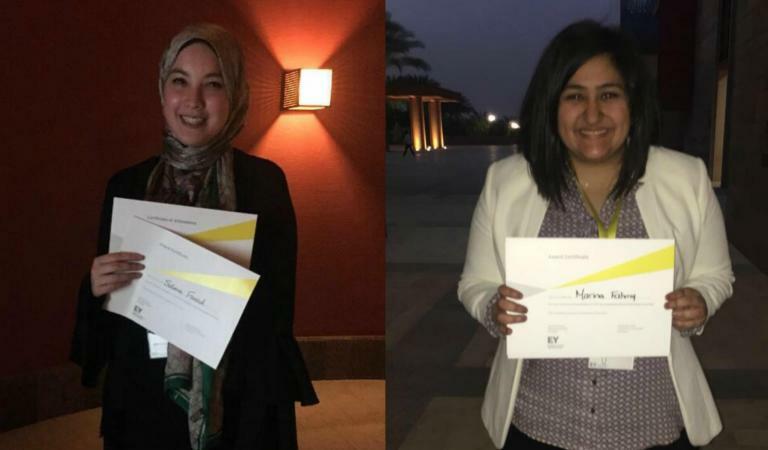 All 10 winners of the competition now have the opportunity to participate in a summer internship with EY after submitting an application, interviewing and taking some exams. This experience has the potential to lead to a full-time position after graduation. The competition challenged participating students to show off their skills and learn more about tax services as well as other financial practices. After hearing from several professions from EY, one of the largest professional services company, each university team was prompted to present on assigned topics, including corporate tax, withholding tax, salary tax and value added tax. Putting their theoretical knowledge into practice, students saw the more exciting and active side of being a tax professional. They had the chance to learn that the topic of taxes is neither an isolated nor an insular one. “Taxation is not only related to the tax department, but is actually interrelated with other departments in a firm,” said Abutaleb.